Luis Suarez will discover the outcome of his appeal against a four-month ban for biting at 14:00 BST on Thursday. The Court of Arbitration for Sport (Cas) verdict will be released on Thursday, with the detailed reasons for the decision published at a later date. Suarez's legal team argued his ban from all "football-related activity" for biting Italy's Giorgio Chiellini at the World Cup was excessive. The Uruguay striker, 27, was also suspended for nine international games. Suarez was a Liverpool player at the time of his clash with Chiellini but has since left Anfield to join Barcelona in a £75m deal. "Don't be too surprised later today if Cas reduces the punishment handed to Luis Suarez. Effectively, Suarez, Barcelona and the Uruguay FA have argued that Fifa's extension of the ban to apply to domestic matches was disproportionate. Fifa can apply such bans to club football, but its own rules suggest this is for exceptional off-field offences concerning the integrity of the game, like doping or match-fixing." At last week's hearing in Lausanne, Suarez's legal team was expected to argue that he should be allowed to train with Barca during his suspension and that his ban should be limited to international football. Barrister John Mehrzad, of Littleton Chambers, feels such an approach offers the best chance of success. "In a nutshell, Suarez's best two grounds of appeal are: Fifa did not have the power to ban him from domestic club games; and/or a ban from 'all football-related activity' for four months - or at all - is disproportionate," said Mehrzad. 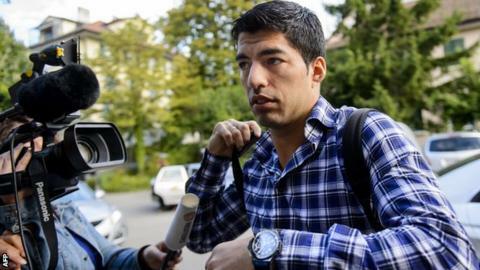 Ahead of the hearing, Suarez's legal team were confident they could argue to have the ban halved, meaning he would be available to play from 25 August. The ban handed down from world governing body Fifa was the longest in World Cup history. Suarez apologised afterwards, despite initially claiming to have lost his balance. He has previously been suspended for biting PSV Eindhoven midfielder Otman Bakkal and Chelsea defender Branislav Ivanovic. He was also given an eight-match suspension and fined £40,000 for racially abusing Manchester United's Patrice Evra in 2011.